SK Motion: Vanquish Products has New Parts for the Axial SCX / JK 4 Link Conversion Kit with Stock Axles. 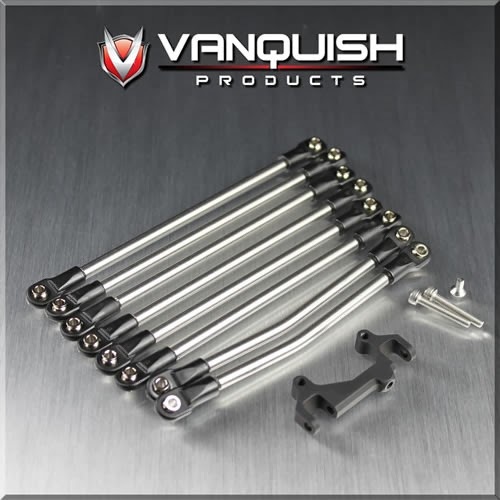 Vanquish Products has New Parts for the Axial SCX / JK 4 Link Conversion Kit with Stock Axles. Vanquish Products has a New SCX/JK 4 Link Conversion Kit for the Stock Plastic Axles for the Axial SCX10 (part# VPS06970). Vanquish Products Aluminum 4 Link SCX Kit. Precision CNC machined from solid billet aluminum. Allows stock front axle servo plate to remain without obstruction. Replaces The stock plastic 3 link with true 4 link suspension. 1ea. Vanquish front 4 link mount. hardware to mount 4 link mount. 2 ea. upper front titanium links and rod ends. 2 ea. lower front titanium links and rod ends. 2 ea. upper rear titanium links and rod ends. 2 ea. lower rear front titanium links and rod ends.